Talk about a well run race. Organization wise, that it is. 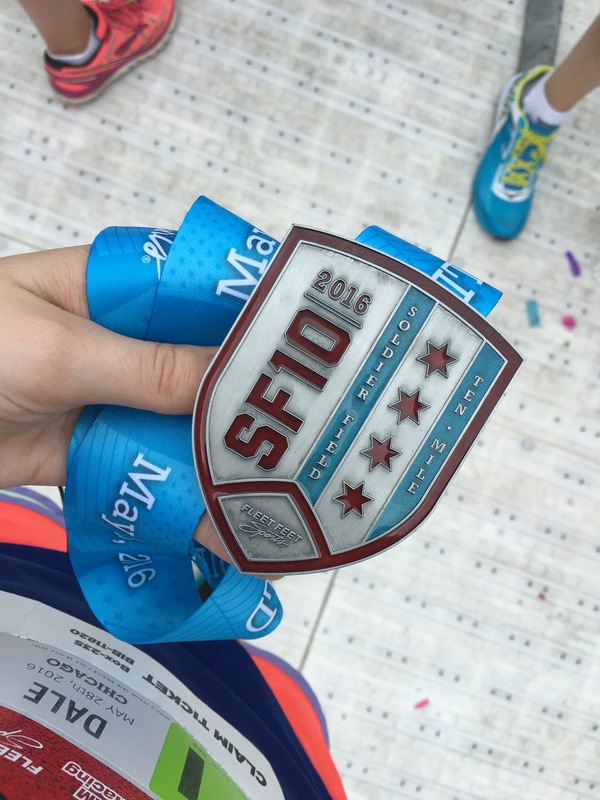 The Soldier Field 10 Miler wasn’t a personal well-run race, but I loved the race itself. 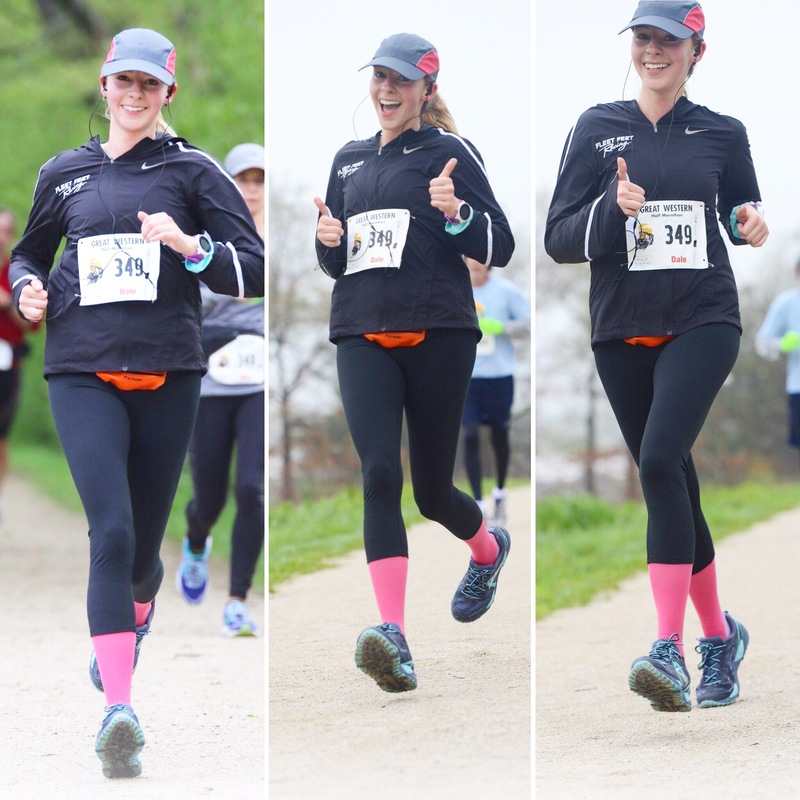 10 miles is always a favorite distance for me and I was excited for this race. Unfortunately, it was about 80 degrees and super humid at the start. And I spent the day before at Wrigley Field and had a few too many beers, so I wasn’t exactly as hydrated as I should have been. I forgot to submit proof of time, so I got stuck in corral I. I had wanted to run with my racing team friends, but they were in top corrals and I wasn’t able to sneak up by them. I started out at my ideal pace…ran the first two miles at 8 minute pace, but the humidity really got to me. I wasn’t prepared for summer running. So, my pace slowed over the rest of the race. My Garmin died at mile 7 (did I mention I wasn’t prepared well for this race?) so I have no idea how fast my closing miles were, but I felt like I picked it up. There were plenty of water stations along the course. It wasn’t over crowded. The mile markers were accurate. The route was laid out well. I honestly don’t have any complaints about the race itself. Finishing on Soldier Field is always a cool experience. And I love the medal. Crossed with a time of 1:24:54. 8:30 pace. And right as I crossed the finish line they bumped the course conditions alert level to red. I was happy to be done. 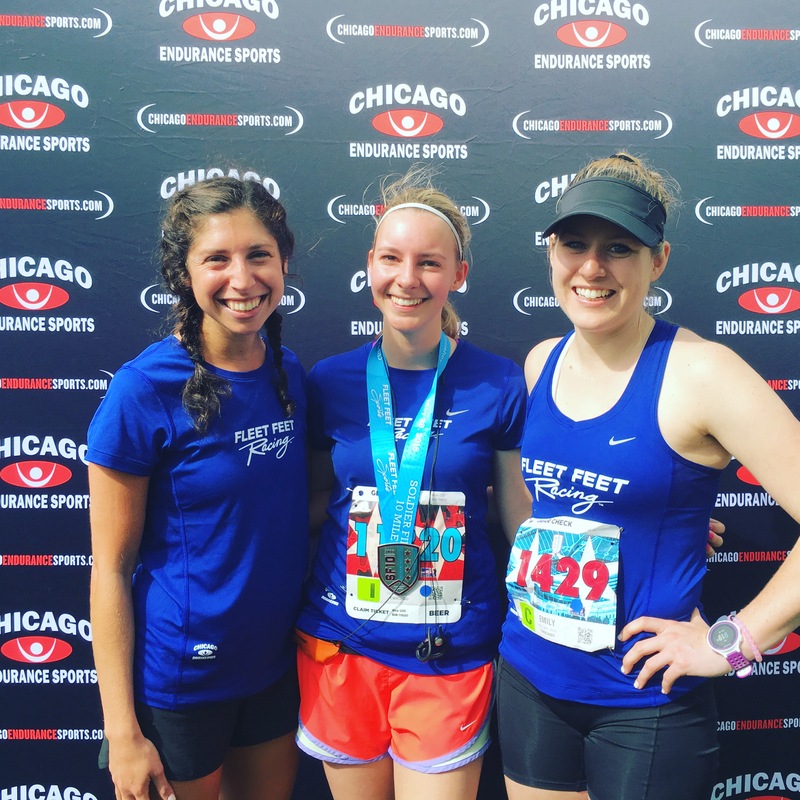 I got to hangout in the Fleet Feet team tent after the race which was really nice. And my teammates all did really well! I loved having the private area. This made me even more thankful I joined this team. Post-race brunch was run too. A free mimosa and a small fiest. Always a good way to celebrate a race. I’ll be back next year! And hopefully I’ll be feeling a little faster. 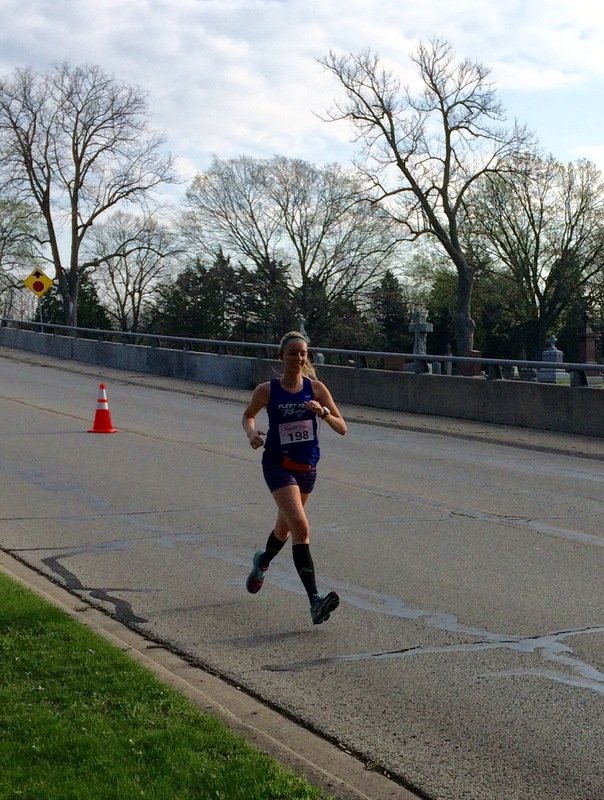 This race brings my spring racing season to a close and I’m so proud of my performances. A lot of great races and great times. Now it’s time to prep for fall racing season. Ready to put in the hard work this summer and crush my marathon in the fall. 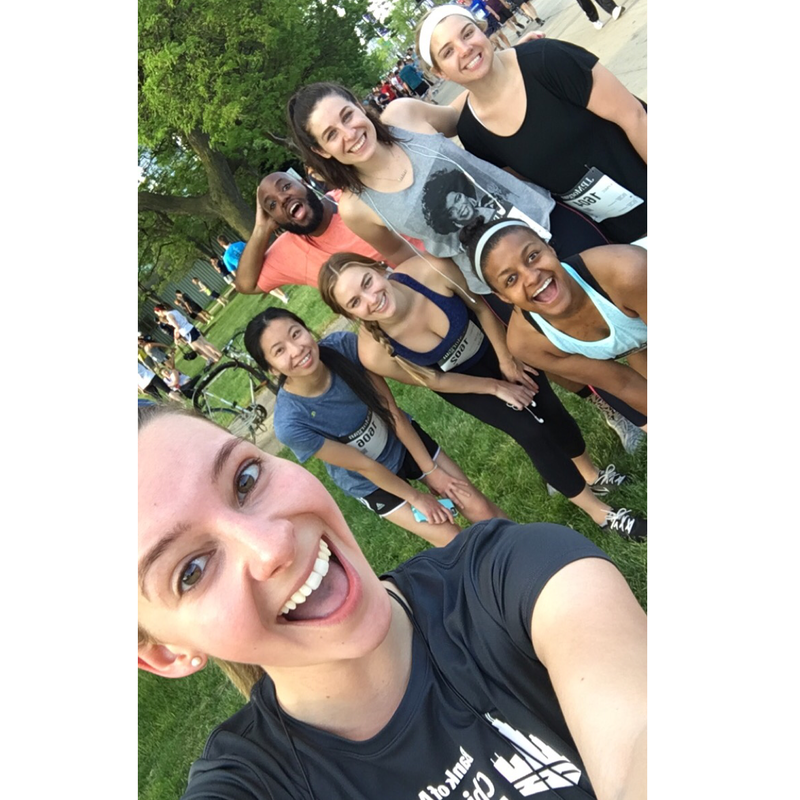 This was my first year participating in the JP Morgan Corporate Challenge and I’m so glad I did. A perk of working at a small company is that I was able to suggest my team participate in this race and hold a few group training runs. I ended up convincing six coworkers to join me and my boss was fully in support of it. The race was Thursday evening at 7 PM. And it was a hot one. Who would have thought it would be 85 degrees in May? But everyone was still excited nonetheless. We all started in the corral together. I wish that the race organizers had split the corrals into walkers and runners because we all ended up spending most of the time weaving around people. That got pretty frustrating. And the tunnels were not ideal. It was so hot down there and this race had 27,000 runners so it was really crowded. I was worried for a lot of people. The most frustrating thing though was seeing how many people cheated. I know this race brings out a lot of people who “don’t run” but you signed up. You’re participating. Walk all you want, but please don’t cheat. 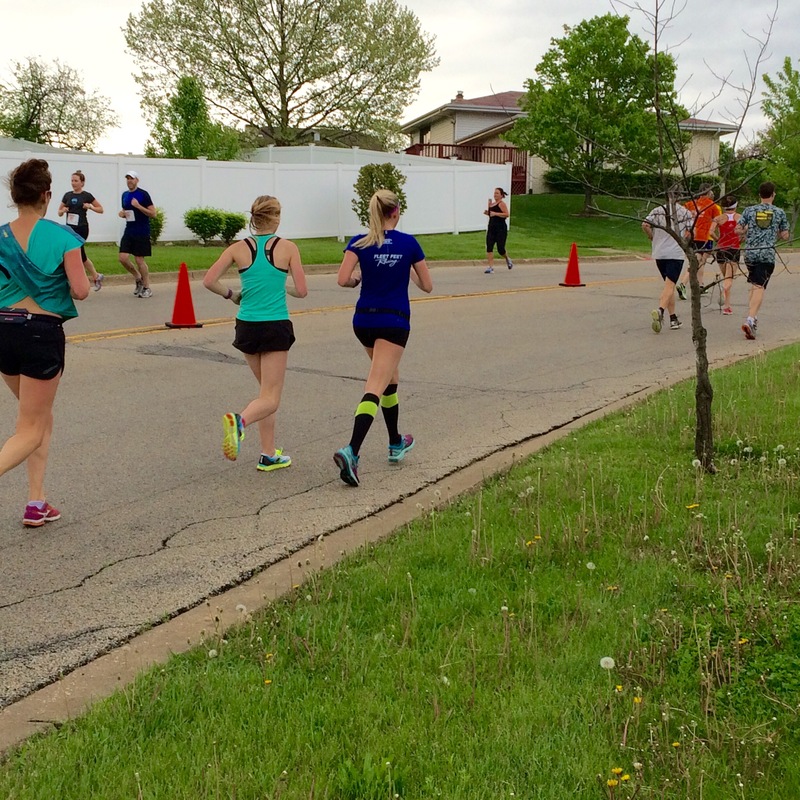 I watched at least 100 people cheat a turn-around that probably cut 0.25 miles out of the 3.5 miles race. It just angered me. People saw one person do it and then all followed suit. In my wave I was the only person that went all the way around. That shouldn’t have happened. I also ran past a man who was being resessitsted and that shook me up. The next day I saw a news article that said he had passed away. Only 39. So sad. This was a reminder that every day is a gift and we should all try to get the most out of life. Everyone on my team crushed the race. I was so proud of them all. They all finished with great times and smiles on their faces. I’m so glad I was able to pull this one off and motivate them to join me. It was a great bonding event and they all did so well. I crossed the finish line at 28:54. 8:15 pace. No crazy records for me, but I was happy with it given the heat and the crowds. We all celebrated with pizza and beer after the race of course. And we’re already excited for next year. I’m just hoping it’s organized a little bit better in 2017, but overall I did enjoy the race. What I lacked in workouts last week, I definitely made up for this week! I had a really killer week, so I thought I’d share a little recap. Plus I went to 4 different studios and I’d love to share what my experience was like at each one. After work I ran 2.5 easy miles along the lake with some coworkers. We’re gearing up for the Chase Corporate Challenge next week, so I’ve been hosting little group runs on Monday nights. It’s fun to have running buddies! The 500 Calorie workout at Enrgi Fitness is a one hour high intensity class. Strength circuits combined with cardio moves. I LOVE these workouts. They push me to the limit, but in a good way. The instructors are welcoming and willing to make modifications for you. They encourage you to push yourself, but tell you that you can take a break if you need it. I always leave the studio feeling sweaty, exhausted, and accomplished. Overall, a really tough, great class. Wednesday nights are speed workouts with my Fleet Feet Racing Team. This week was a 3 mile progression run. I didn’t exactly progress how I planned, but I didn’t check my watch at all, so I was just running by feel. The workout was a 2.08 mile warm up. 3 mile progression. Mile 1- 7:19. Mile 2- 7:34. Mile 3- 6:48. 1.93 mile cool down. The workout went by so quickly. I really just love to run fast and especially with a team. It ended up being 7.02 miles total at 8:04 average pace! This was my first time trying Kick@55 Fitness. I registered for the Booty, Burpee, and Barbells class not really realizing how challenging it would be. This class it NOT good for beginners. I wouldn’t have been able to make it through this class at this time last year. I did get through it, but it was tough. So. many. burpees. They weren’t kidding when they put it in the name. I honestly didn’t really like the vibe of the studio. I didn’t feel welcomed as a newcomer once I was in the room for class. Breaks were not encouraged and I felt the need to really push myself. This was good and I had a good workout, but I didn’t connect with the instructor and a couple things that were said bothered me. I will probably go back and try a second class though. And when I got home from the workout, exhausted, of course my boyfriend wanted to go for a run. I couldn’t say no. So, we went out for 2.05 quick miles to end the evening. I was BEAT. Signed up for this themed ride on a whim with my friend on Thursday. Studio Three cycling classes are my favorites and I couldn’t pass up a dual-taught Parental Advisory themed ride with my favorite instructors even if it was at 5:30 PM on a Friday. The class didn’t disappoint. 500+ calories burned with a smile on my face the whole time. The music was perfect. The instructors were hilarious. It was just really really fun. This studio has been my favorite one I’ve gone to. Great energy, super welcoming, and really fun. The instructors are intense, but friendly and motivating. I haven’t had one bad experience here and I’ve gone to 10+ classes now. It’s fantastic! And this class was a great way to start the weekend. Long run this weekend was 8 miles with Carly. It took a long time for us to get out the door, but by 5:30 PM we finally did. From our apartment front doors it’s about 2 miles for each of us until we run into each other. We met up, then went to the lake path and ran the last 6 miles together. We weren’t feeling our best, but we got through the run and had a little bit of fun. The weather was perfect and we got to run in our favorite city. How could we have a bad time? It’s great to have a running buddy. I wouldn’t have run this day if she hadn’t convinced me to. My boyfriend and I ran 1.50 miles in the morning to start the day and ended at our favorite coffee place to grab some cold brew. Then I went to Brunch x Burn at Equinox for a spin class. This event was so much fun. A 45 minute Beyonce vs. Jay Z spin class followed by lots of freebies (Quest nutrition, Juice Rx, etc.). All the money from the event went to the Avon breast cancer walk. So happy I was able to make it! Already looking forward to the next one. Proud of myself for putting in the work this week. My legs are really sore, but I’ll take it easier the next two weeks before I start marathon training. I just really needed a solid week of good sweats and hard work. 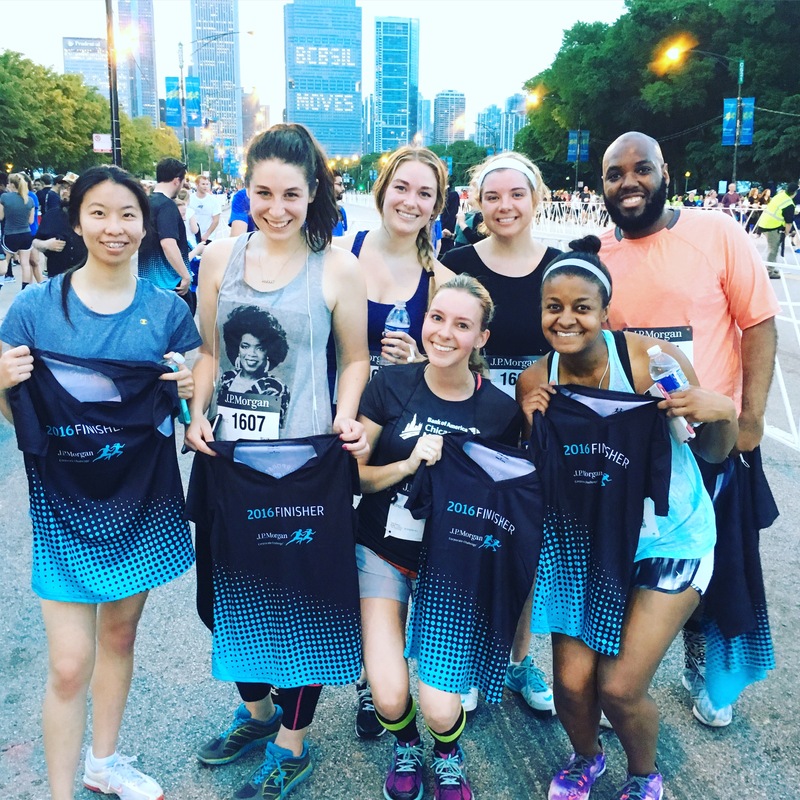 It’s race week again this week: Solider Field 10 Miler on Saturday and the Corporate Challenge 3.5 Miler on Thursday! Looking forward to the new week. Hope you all have solid workouts! The Quarryman. 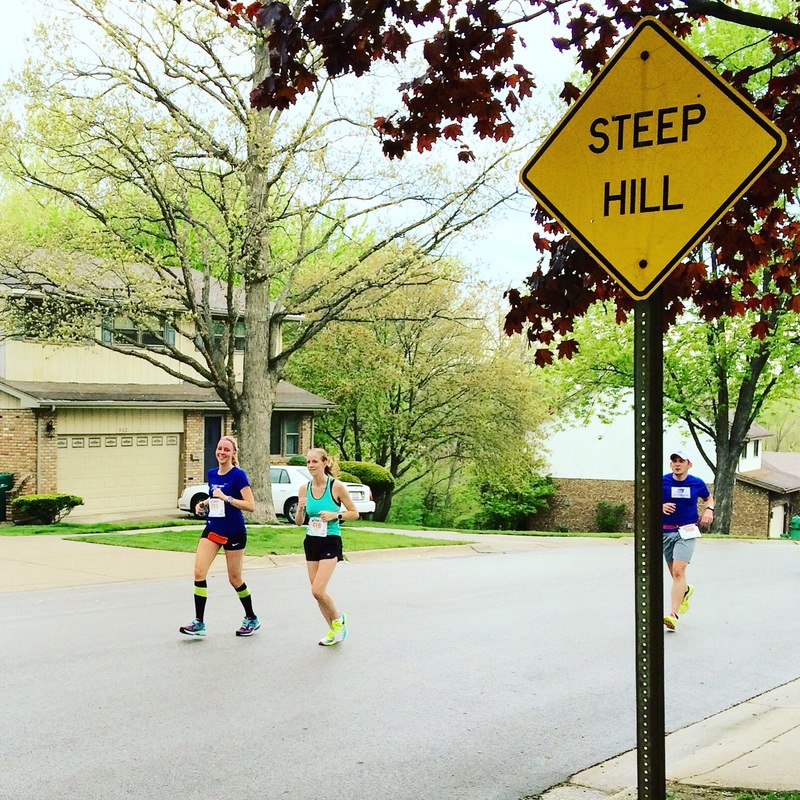 A 10 mile race filled with hill after hill after hill. And not just slight inclines, but HUGE hills. This race is no joke. I debated skipping it this year because it would make three race weekends in a row and I didn’t know if I’d be able to do it, but I love that it’s my hometown race and that it’s so challenging. I couldn’t resist. I haven’t been training on hills because my new home isn’t near any hills. At all. But I’ve always been fairly good at them, so I wasn’t too worried. One of my good friends texted me the Monday before the race and said she wanted to sign up, but wanted to see if we could run together. I was thrilled. Running company can make all the difference, especially on this tough course. 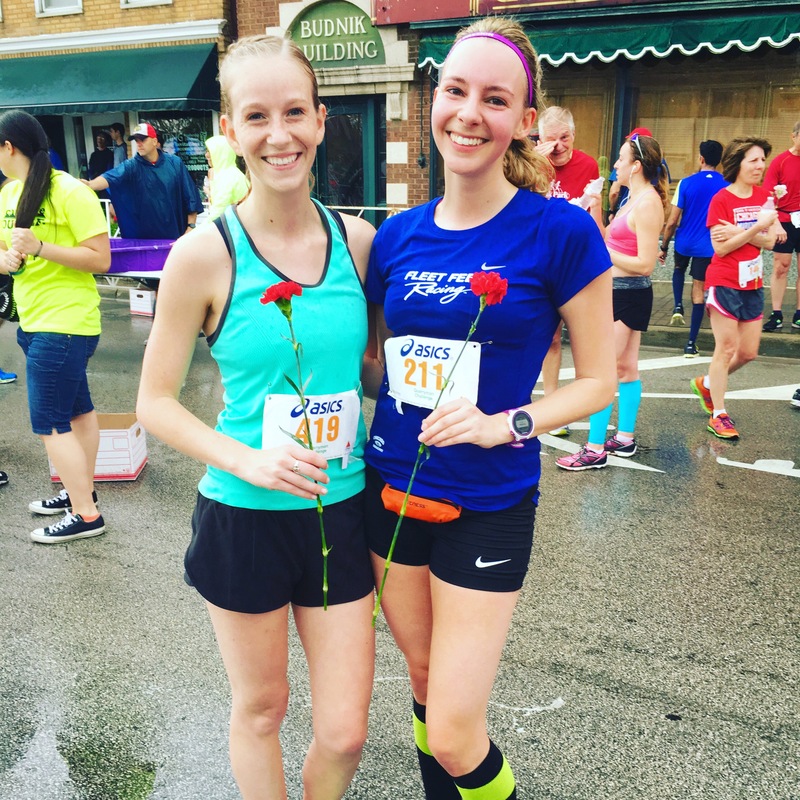 Jen was running Quarryman for the first time this year and I was really excited for her. It’s a crazy challenge, but conquering it is an amazing feeling. I knew she’d crush it! And we’d be done with 5 months of our New Years resolution. Molly and I met up at the start and she seemed ready to go. 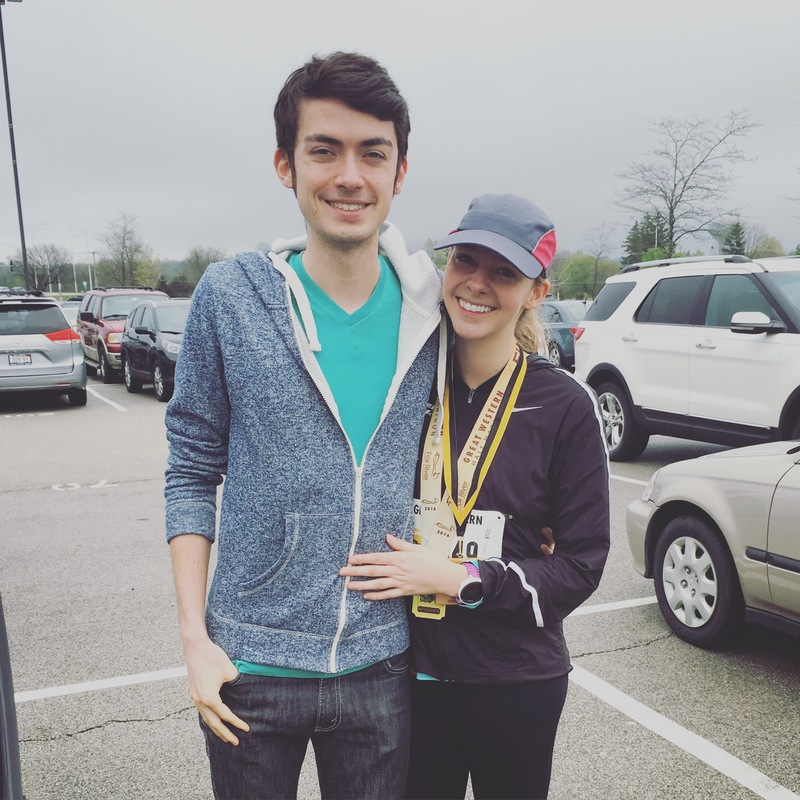 Her goal was 7:45 average miles and I told her that I didn’t have that in me, but that I’d give it my all. The first major uphill is a half mile of an incline. It’s crazy. And we ran that mile at 7:46. We decided after that to slow down because we were already breathing heavy. We had a lot more race to go. Molly told me to go ahead a few times, but I wanted to cross the finish line together. Her legs were screaming and I wasn’t going to leave her. We were in it together. After mile 8 it was pretty much smooth sailing. The major hills were done and we were so close. We picked up the pace a little and focused on the end in sight. 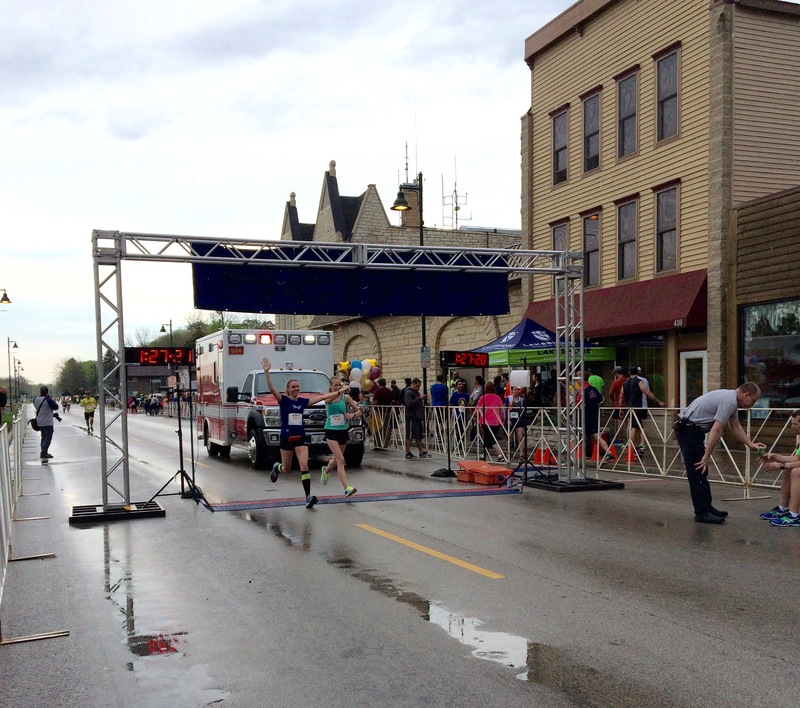 The finish line was a little sad because an ambulance was in the way. A man had collapsed at the finish and that always freaks me out and makes me feel so sad. He looked okay, but the paramedics were still going to take him. We were still happy to finish. We crossed hand in hand at 1:26:58. 8:42 average. And we were actually 1st and 2nd in our age group! 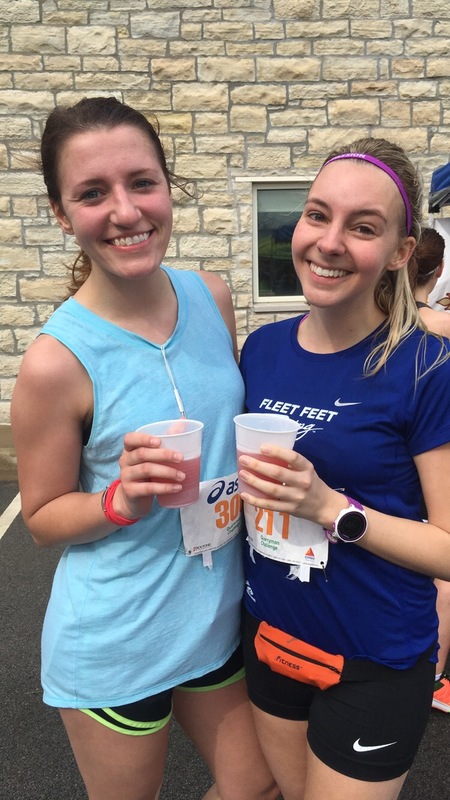 I was so proud of Molly and I loved that we were able to run the whole race together. Jen did really well too and we enjoyed some post-race local beer and laughed about just how hard the race was. She described the whole race as feeling like miles 20-26 of a marathon and I couldn’t agree more. Your legs are shot, you’re tired, but you push through. They don’t call it a challenge for nothing. The Quarryman is crazy, but this was year three for me and I keep coming back for more. You’ve got to challenge yourself, right? I’ve always loved the half marathon distance, so I won’t pass up the chance to run one. 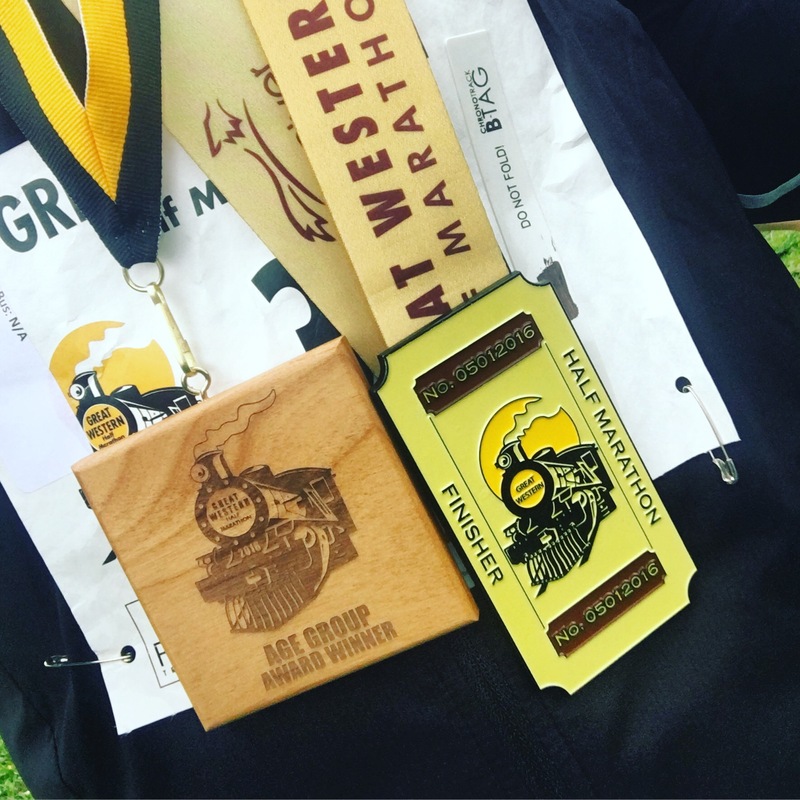 My boyfriend’s Mom suggested the Great Western Trail Half Marathon as a Spring race and I agreed right away. I love trail running and this race seemed like a fun one. It was relatively cheap for a half and during a good time of year. I went to this race without any time goal. 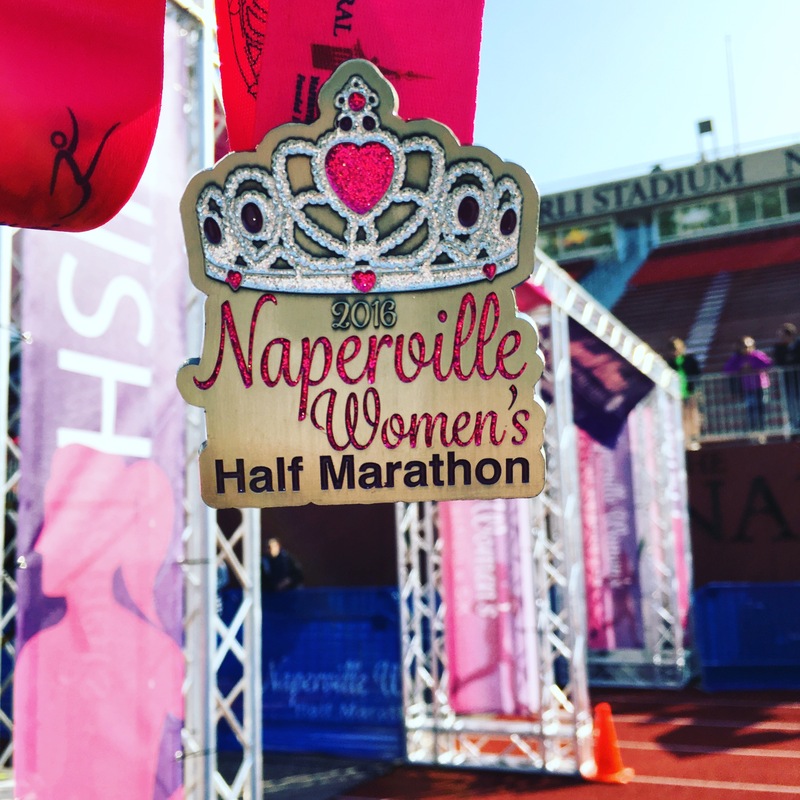 I had just run Naperville’s half the weekend before so I was treating this race like more of a training run. It was very cold at the start of this race and we had to wait around for a bit after the shuttle dropped us off before we could get to the start line. We all had to walk about a half mile to get to the start line which was a little frustrating, but mainly because I was so cold and just wanted to get moving. I turned the music up, hid my watch under my sleeve, and took in the scenery as I went. I didn’t know what pace I was running and I didn’t care. My toes were frozen for the first couple miles, but they regained feeling later on. The surface was great to run on and I loved that the course was a point to point. I’d never run a race with a course like this. 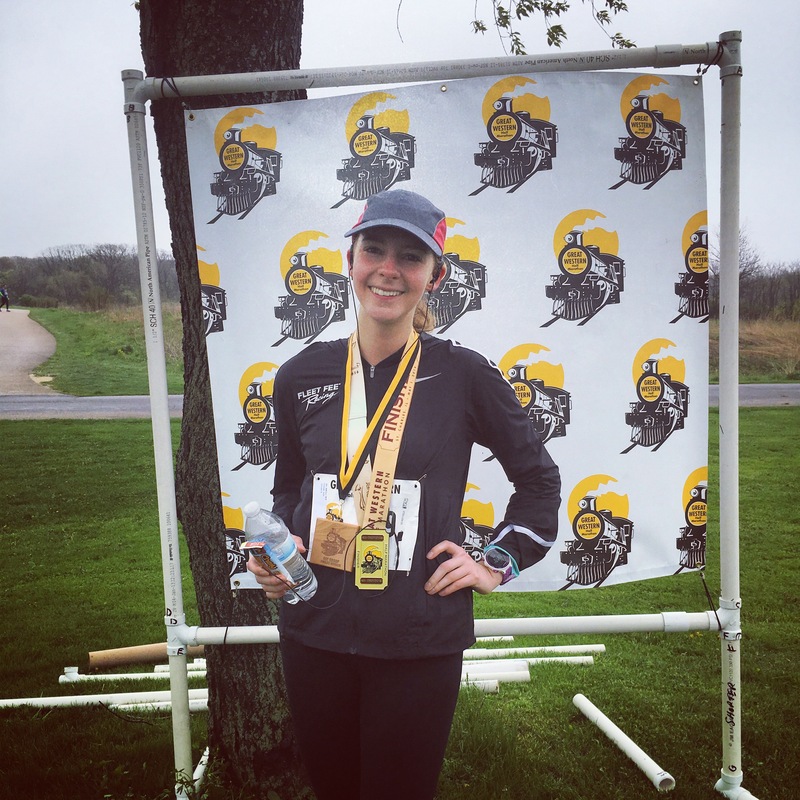 I basically ran in a straight line for 13.1 miles and I enjoyed it even more than I thought I would. I crossed the finish line at around 1:48 and I felt great. I was smiling and I was proud. 8:16 average pace and it was enjoyable. And I ended up placing second in my age group, so I got an extra medal! And Kyle showed up at the end which made me really happy. I love that he’s so supportive of my crazy running habits. He definitely gets it because his Mom loves running so much too and I’m thankful I have the chance to run races with her. Also loved the fact that this race offered free photos! You can see how much I was enjoying myself. I’m so so glad I was able to run this race. I signed up on a whim since registration opened at $5…couldn’t pass it up! I got in for $30, which is as cheap as it gets for a half marathon. And I think it’s pretty cool to be able to run the inaugural race. 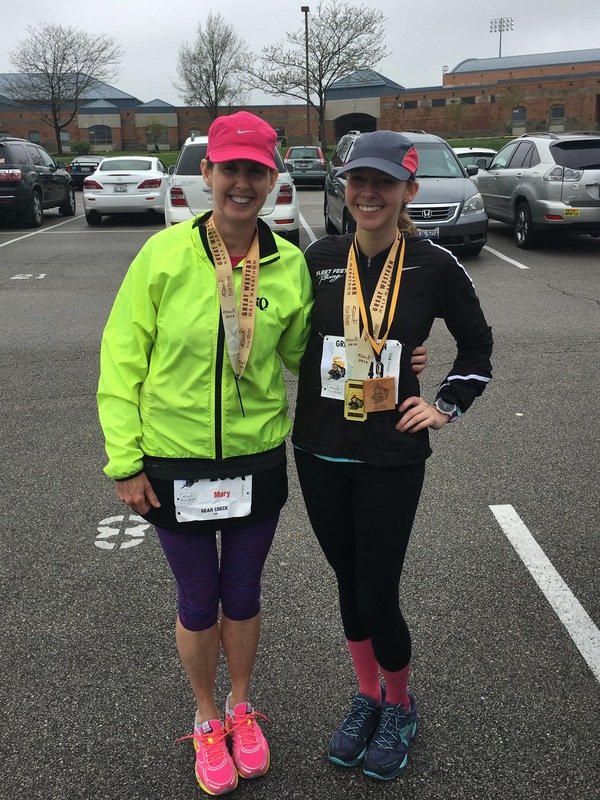 I didn’t sign up for this race with anyone, so I was running alone, but I convinced my Mom to come along to watch! Always thankful she’ll get up early, take photos, and cheer me on. I had no real time goal for this half. I had just PR’ed at my March half, so I didn’t want to push it and try again less than a month later. 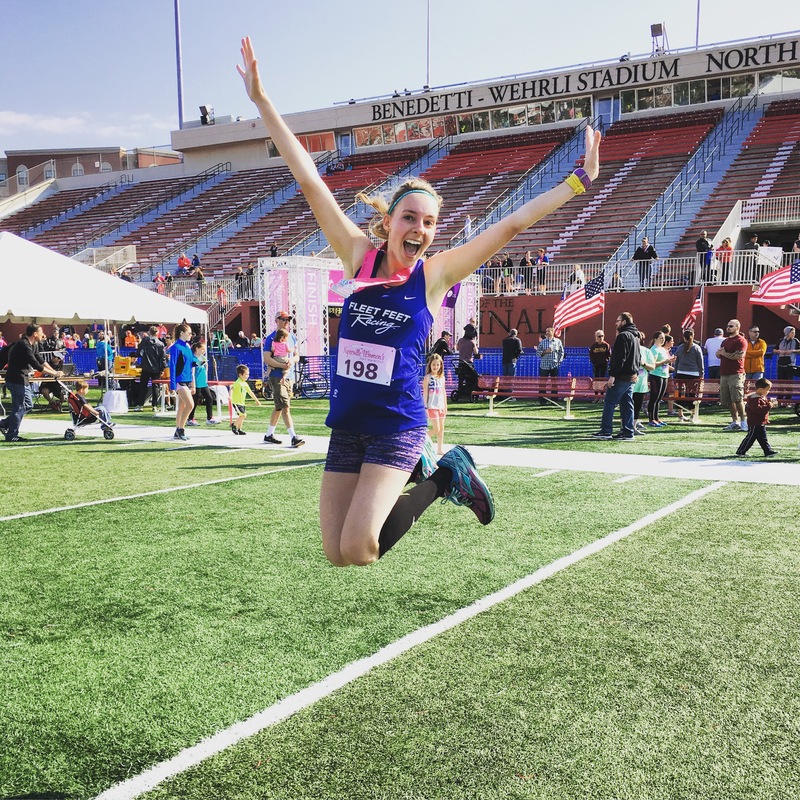 I decided to just run at a comfortable pace and have a stress-free, enjoyable race. This race was really well organized which is part of the reason I enjoyed it so much. The course was well marked with volunteers and I love when it’s an actual person telling you which way to turn rather than just an arrow (especially since I’ve gone the wrong way in a race before). There were a decent amount of fans on the course and I was able to see my Mom around mile 6. Crowd support makes such a difference. I hardly glanced at my Garmin during the race. I knew I was running at a good pace, but it felt comfortable. The miles flew by and I didn’t feel very tired. I picked up the pace during the last mile because I had a lot of energy left. It ended up being my fastest mile of the race and I crossed the finish line at 1:40:01. Less than two minutes away from my March PR and this run was fun, felt “easy.” I never would have thought I’d run 7:38 average paced miles for a half marathon and feel like it wasn’t super difficult. My running has improved so much in the past year and I love seeing the hard work pay off during a race. The medal was really girly and unlike any medals I have. And I was the 36th woman overall! Beautiful day. Well run race. I’ll definitely be signing up again next year!